Enable tracing: use this option to turn tracing on or off. Show Exception Info: enable this option if you want to know about the exceptions triggered in case of abnormal exit. 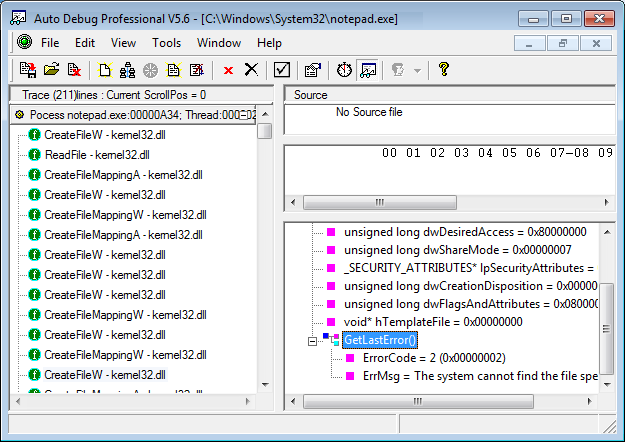 Call OutputDebugString(): enable this option if you want to see the result of calling OutputDebugString() in the Windows kernel. Since we cannot always know (for want of source code, in a typical scenario) how many arguments each function has, and in the case of pointer arguments, how large is the memory area holding the data addressed by those arguments, we have to make uniform assumptions about these numbers. For example, if you set the number of arguments to five, while most of the functions you trace have a smaller number of arguments (or, to be precise, their arguments occupy less than five positions in the stack), Auto Debug will save the first fvie positions in the stack before and after each call, but it will not tell you which of these five values (param[0 .. 4]) are the true argument values. You will have to figure it out based on the function prototype (which Audo Debug does get right in most cases). So if a function has one argument of type long, and if it uses the typical C calling convention, you will find that argument's value in param, while all other param entries will have nonsense values in them. If the argument is of type int (or short), it will occupy only the two least significant bytes in param, while the senior two bytes may hold nonsense values. You may run into a function that uses eight arguments, and if the number of presumed arguments is set to five, the last three will not be registered. In that case, if those arguments are important to know, you can increase this number and re-run the trace, but it is always better to start with a smaller number and increase it as necessary, because there is a performance penalty associated with a large number of arguments. It is possible to run out of memory with this number set too high. Similarly, if you expect certain arguments to point to strings or to other structures in memory, anticipate how many bytes of memory to dump for each argument, if you want to read such data. Auto Debug has no way of knowing the size of the data, so once again, you will have to presume a certain size that will allow you to read (or at least recognize) most such objects, then increase it in subsequent runs if it is not sufficient. Like with the number of arguments, there is a risk of running out of memory with this number set too high.